New Balance 890 v5 are neutral performance running shoes. The New Balance 890 v5 is one of the most popular performance running shoes for neutral runners in the market thanks to impressive blend of cushioning and lightweight. Putting those together with a flexible low profile (just 8 mm drop!) features outstanding responsiveness for racing or daily trainings. Check different width (narrow, standard, wide) availability for custom fit. 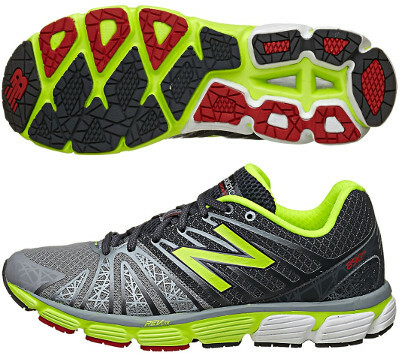 There are no major changes in this fifth version from its predecessor the 890 v4. Upper has been slightly redesigned based on the same seamless breathable air mesh with FantomFit relocating fused synthetic overlays for better fit. Cushioning relies on full length REVlite midsole and an ABZORB® crash pad for impact protection and supreme comfort. Besides lightweight and breathability properties, FantomFit provides a lot of flexibility in order to create different upper designs and the american brand has taken advantage of this and released several limited editions because of popular marathons around the globe: New York, London, Rome, etc.